The steel industry is one of the highest CO2-emitting industries, accounting for 7 percent of CO2emissions globally and 10 percent in Sweden. A growing global population and an expanding urbanization are expected to trigger a rise in global steel demand and by 2050 steel use is projected to increase 1.5 times compared to today. Even if the level of recycled scrap will increase it will not be enough to meet the total global demand. We will need to produce steel from virgin iron ore also in the future. The carbon footprint in the steel industry is thus a challenge for Europe and the rest of the world. Therefore, SSAB (global leader in high-strength steels), LKAB (Europe’s largest iron ore producer) and Vattenfall (one of Europe’s largest electricity producers) created HYBRIT, joined in a determination to contribute to a more sustainable society. HYBRIT is short for Hydrogen Breakthrough Ironmaking Technology. 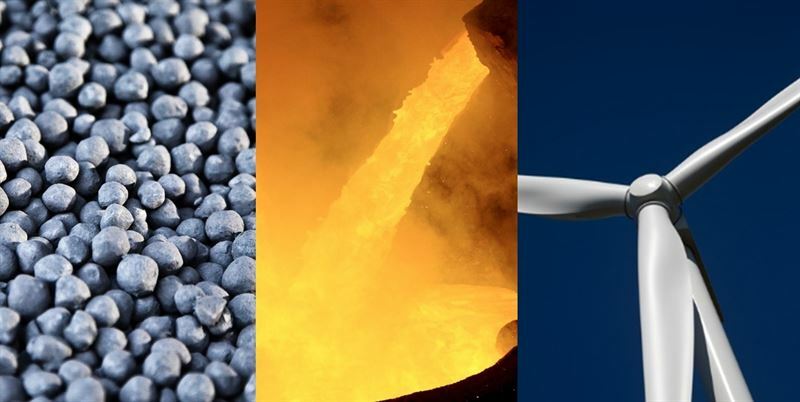 What makes HYBRIT unique, is that the project aims to solve the root cause of the problem, by replace coking coal, traditionally needed for iron ore-based steelmaking, with fossil-free electricity and hydrogen. The result will be the world’s first fossil-free steelmaking technology. We will go from CO2to H2O as by-product. Hybrit Development AB is a joint-venture between the steel manufacturer SSAB, the mining company LKAB, and the energy company Vattenfall. The objective of the joint- venture is to develop the world’s first fossil-free, ore-based steelmaking process. The project started during the spring of 2016, and the goal is to have an industrial process in place by 2035. The byproduct of using fossil- free electricity and hydrogen in steelmaking instead of coke and coal, will be water instead of carbon dioxide. The initiative has the potential to reduce Sweden’s total carbon dioxide emissions by 10 percent. The HYBRIT initiative has been granted financial support from the Swedish Energy Agency. The Research Project 1 (RP1) is a comprehensive collaboration among industry, universities, and research institutes aimed at ascertaining fossil-free steps in the energy, mine, iron, and steel value chain. www.hybritdevelopment.com.